Three out of four endurance athletes are concerned about their body weight, but fad diets can be dangerous for athletes. Now runners, cyclists, and triathletes can kick off their 2011 season with a rapid weight-loss training program from best-selling author and coach Matt Fitzgerald. Racing Weight Quick Start Guide: A 4-Week Weight-Loss Plan for Endurance Athletes is the first fast-paced weight-loss training plan designed for endurance athletes. The Quick Start Guide is now available in bookstores, endurance sports shops, and online. Racing Weight Quick Start Guide applies all the principles of the best-selling book Racing Weight in a detailed set of weight-loss training plans that are designed to help athletes shed weight quickly. Athletes will devote 4 to 8 weeks to starting a weight loss of 5, 10, or 20+ pounds. Readers will drop pounds quickly as they follow a schedule of high-intensity workouts and strength training as well as a menu of calorie-restricted, high-protein meals and snacks. Low-volume and high-volume plans make it possible for cyclists, runners, and triathletes with a wide range of experience to maintain their training levels. These athletes will replace fat with muscle while keeping their appetites in check. Once they have hit their quick start weight-loss goals, readers can continue to lose unwanted weight using the proven strategies of the Racing Weight program. Athletes will zero in on their racing weight through improved diet quality, balanced macronutrient levels, proper timing of meals and snacks, appetite management, and training for lean body composition. 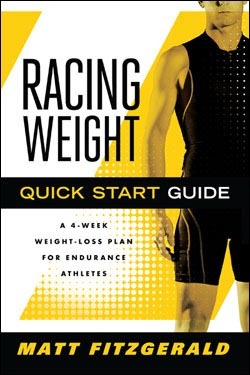 The Racing Weight Quick Start Guide will accelerate every endurance athlete's season for leaner and faster racing. Matt Fitzgerald is the author of numerous books on running, triathlon, nutrition, and weight loss. His most recent books are RUN: The Mind-Body Method of Running by Feel, Racing Weight, Brain Training for Runners, and The Runner's Diary. He has been a contributor to Men's Fitness, Men's Health, Outside, Runner's World, Bicycling, Running Times, Women's Running, and other sports and fitness publications. Fitzgerald is a featured coach on TrainingPeaks.com and Active.com. He is a certified sports nutritionist (CISSN) licensed by the International Society of Sports Nutrition. He lives and trains in San Diego, California. VeloPress is an endurance sports and fitness publisher with books on cycling, triathlon, running, swimming, nutrition and diet, yoga, and the histories and personalities of our sports. VeloPress is the book-publishing division of Competitor Group, Inc., which publishes VeloNews, Triathlete, Inside Triathlon, and Competitor magazines and produces the Rock 'N' Roll marathon and half-marathon series, TriRock triathlon series, and the Muddy Buddy adventure race series.